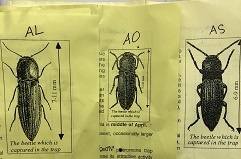 Spring is a critical time to assess wireworm populations because when soil temperatures warm to 50°F, larvae begin to migrate up within the soil column and seek underground plant tissues to feed on. Root crops are most commonly damaged, but chewing on seeds, seedlings, and fruit also have been reported. I am coordinating a pitfall trapping effort to determine if non-native adult click beetle species are present in western Oregon (contact me if you’d like to participate). To monitor your own fields, bait stations are recommended, because they are a better indicator of actual, larval (wireworm) pressure. For more information, click the link to read a publication by Nick Andrews et. al re: Biology and Nonchemical Mgmt. in PNW potatoes. Posted in degree-days, invasives, pest ID. The definition of Precision Agriculture has evolved over 22 years and has more than a few associated acronyms (PA; SSCM=site-specific crop management; VRT=variable rate technology). If one were to attempt to summarize the definition of PA: it involves awareness of growing conditions within a field and the use of technology as a decision support tool to maximize production efficiency while minimizing environmental impact of agricultural inputs. We may be most familiar with PATs (Precision Agriculture Technologies) such as GPS-guided tractors or the use of UAVs (unmanned aerial vehicles AKA “drones”) as imagery sensors or product applicators. So many acronyms! Other PATs include robot weeders and mechanized transplanters. Resources closer to home include the UAS at OSU program, and a fellow Beaver blogger who has a great annotated resource list about Drones in Agriculture here. Perhaps you’re not quite ready for autonomous tech. One simple and easy way to jump on the PA bandwagon is to use calibration tools. These are based on mathematical models of soil and crop parameters for a specific latitude, soil type, etc.. At the click of a button, they provide output estimates to help schedule irrigation, determine fertilizer needs, or predict harvest dates. These are in addition to the MANY mobile apps now available. Another new trend (and a way to sneak in one last acronym) is for companies to offer SaaS: Software as Service, like our friends at Valley Agronomics. As you go about planning and planting this year, why not give these PA tools a try. The program developers are usually very receptive to comments, as it helps them improve the models, or know that they are working adequately. DISCLAIMER: Mention or links to any of the products or services above do not imply endorsement. Posted in brassicas, degree-days, management, snap beans, squash, sweet corn. Cabbage Maggot – a summertime problem? CRF prefers cool weather and activity tends to diminish during the summer heat. Eggs were detected 4WAP and continued to be evident throughout the summer. There was a clear and steady increase in root damage starting at 3WAP in summer. Eggs were present in the fall as well, but the level of root injury was more gradual. 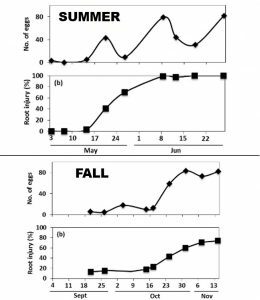 (EGG count = top graph each season; ROOT damage rating = bottom) FROM: S.V. Joseph, J. Martinez / Crop Protection 62 (2014). ANOTHER FACTOR is that Delia radicum is actually part of a much larger ‘rootfly complex’, and different species have different ecological niches, behavior, and activity periods. This table explains some of those differences. Identifying rootflies is hard enough when they are adults, and nearly impossible as maggots and pupae. Thus, they are referred to as a pest complex that can affect growers year-round. This puparium was found 27-Jul-18, suggesting that rootfly activity continues yearround in the PNW. It may be seedcorn maggot, radish maggot, or turnip maggot, as all are known to infest brassica roots. Posted in cabbage maggot, degree-days. Tis’ the Season! According to a pest model for this region, the summer generation of brown marmorated stink bug (BMSB) adults start appearing this week. This pest is very mobile, and will move into fall crops readily. I caught a glimpse of an egg mass in sweet corn today (photo below), and nymphs are expected to peak within the next few days. Bell pepper, sweet corn, and tomato are all considered desirable hosts. Symptoms include sunken kernels, whitening on fruits, and spongy tissue. Rather than re-invent the wheel, I decided to direct you to some GREAT resources (see list below) for BMSB ID and management in vegetables. 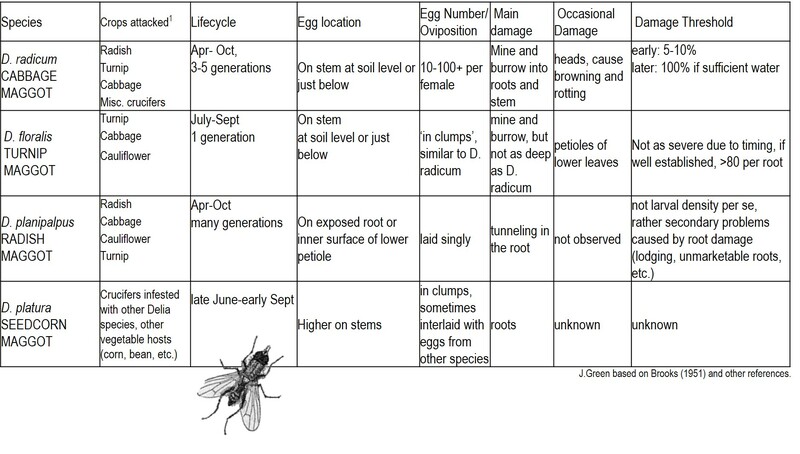 BMSB info for vegetable growers – great photos of injury, explanation of life cycle, etc. Posted in degree-days, invasives, pest ID, sweet corn. WEEK 20 – Diamondbacks continue to hatch; corn earworm flight; beneficial insect tracking. Perhaps most importantly: we found 5 Large Yellow Underwing Moths (the adult phase of winter cutworm)in traps this week. More information is available here. Read the full report here: http://bit.ly/VNweek20 and subscribe on our homepage to receive weekly newsletters during field season. Thanks! Posted in corn earworm, degree-days, diamondback, winter cutworm. All this talk about crop PEST insects should not go unaccompanied by at least a brief mention and applaud for those silent heroes, the BENEFICIALS! Biological control by generalist predators can be quite effective at mitigating pest insect populations, depending on the circumstance. Two of the most common predators that we see in vegetable crops are ladybird beetles (ladybugs) and lacewings. I decided to track activity of these two groups this year, just to see if any activity patterns would be evident. Ladybugs and lacewings can be passively sampled with yellow sticky traps. Although, for a more detailed study, one would want to incorporate sweep net sampling, increase trap numbers per acre, etc. The convergent lady beetle (Hippodamia convergens) is a native species. They overwinter as adults, mate, and then lay eggs in the spring. A study from Corvallis using field-collected H. convergens found that 228 growing degree-days (above a threshold) are required for development from egg to adult, and that this heat-unit requirement is rather consistent throughout North American populations (Miller 1992 Env. Ent. 21). Trap counts began to increase at 228 degree-days this year, which matches published heat unit requirements of H. convergens in literature from this region. Cool! But what does all this mean? Well, it suggests that passive sampling is a good way to estimate ladybug phenology, and could provide us with comparative data on predator activity differences between years. 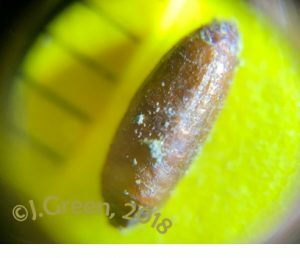 Perhaps more importantly: recognize that while it takes ~230GDD to detect ADULT ladybugs, the larvae are predacious too and have been busy in your fields and gardens all spring!! Plants, like insects, are ectotherms, which means that their rate of development depends on external conditions. Sure, most companies put ‘days-to-harvest’ on the seed packet, but we all know that is just an estimate, and can vary widely by region. It’s greatly influenced by temperature; especially if we encounter variations from the ‘normal’ levels of heat and/or rainfall. Faculty at OSU Extension’s Small Farms Program and the Integrated Plant Protection Center have developed an online, predictive tool to help guide grower decisions and crop planning. The resource is called CROPTIME, and it provides models for a few of the crops grown in Oregon, with aims to develop 50 models (vegetables and weeds) eventually. Here is a 9-minute video that describes how to use the program.